Halifax, N.S. 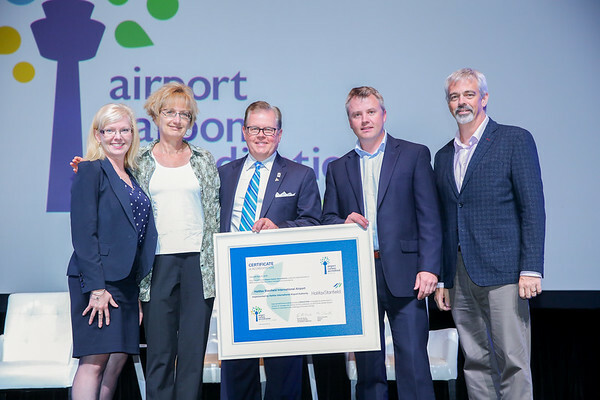 – Halifax Stanfield’s environmental sustainability efforts were recognized this week at the Airports Council International – North America (ACI-NA) conference in Nashville, Tennessee. Joyce Carter, President & CEO of Halifax International Airport Authority, and several members of the Senior Leadership Team received a Certificate of Accreditation at the ACI’s Airport Carbon Accreditation ceremony, signifying an upgrade in accreditation from Level 1 to Level 2 through the Airport Carbon Accreditation Programme. The Certificate recognizes the Airport Authority’s work to manage CO2 emissions as part of the airport industry’s response to the challenge of climate change. Halifax Stanfield’s reduction in CO2 has earned the second accreditation level of reduction. HIAA is now focused on achieving the third accreditation level of optimization, which includes third party engagement in carbon footprint reduction. In May 2017, HIAA joined ACI’s Airport Carbon Accreditation Program, a global consortium of airports dedicated to managing, reducing and ultimately neutralizing their carbon footprint. Halifax Stanfield is one of 12 airports in Canada participating in the program and one of 36 airports in North America that attained accreditation since ACI-NA launched the Airport Carbon Accreditation programme for North American airports in 2014. Please visit airportcarbonaccreditation.org for more information on Airport Carbon Accreditation. Members of the Halifax Stanfield leadership team accepting a certificate in recognition of achieving Level 2 in the Airport Carbon Accreditation Programme.